flexibility to create any event you can imagine. We believe registration technology should be as responsive, intuitive, and flexible as the events you plan. It’s a simple thought. And the one that guides every update we make. See for yourself. We’re handing the controls back to you. The difference between a good event and an awesome experience is all in how you plan. It’s in your control over the details. Our technology removes the friction from your planning and gives you greater dominion over the details that matter—enabling you to see, respond to, and do more. Through a menu of intuitive controls you can design entire event sites from a single window. All in a few effortless clicks. Because creating events should be as fun as attending them. Replay refresh Created with Sketch. Your registration site sets the tone for your entire event. Control perceptions by selecting a base theme and setting the rules for virtually every page element you can think of. Style once. Apply all. Create registration sites that work beautifully on every device right out of the box. Simply resize your browser at any point to experience what your site feels like on desktop, tablet, or mobile. It's what you asked for. And it's what your attendees expect. Project Flex powers registration for companies of every size. SMARTER WORKFLOWS THAT MAKE MANAGING YOUR NEXT EVENT REGISTRATION A BREEZE. Sometimes you need to pause, step back, and change gears before publishing live to the world. So we added ‘save’ to give you some breathing room between versions. Just one more button and one less thing to worry about. Need to make a change? Restoring earlier versions of your site has never been easier. Two clicks transport you to any iteration from within your published history. And we made sure to pin your current version to the top so you always know you’re working on the right one. Our technology has your back when you need to build and design sites quickly. It double checks your work each time you save or publish—or whenever you choose—to guarantee your attendees always have a great experience. It’s never been easier to make your events what you want them to be. Arrow Left Created with Sketch. Arrow Right Created with Sketch. Do anything you set your mind to. There are two types of event planners: The ones who plan events, and the ones who create experiences you can’t wait to attend. Project Flex transforms everyday events into moments worth anticipating. Project Flex is the smart way to plan powerful registration experiences of any size. Check out our customer resources. Learn how we can help power your event registration. Try Cvent's industry leading event management software for free now. 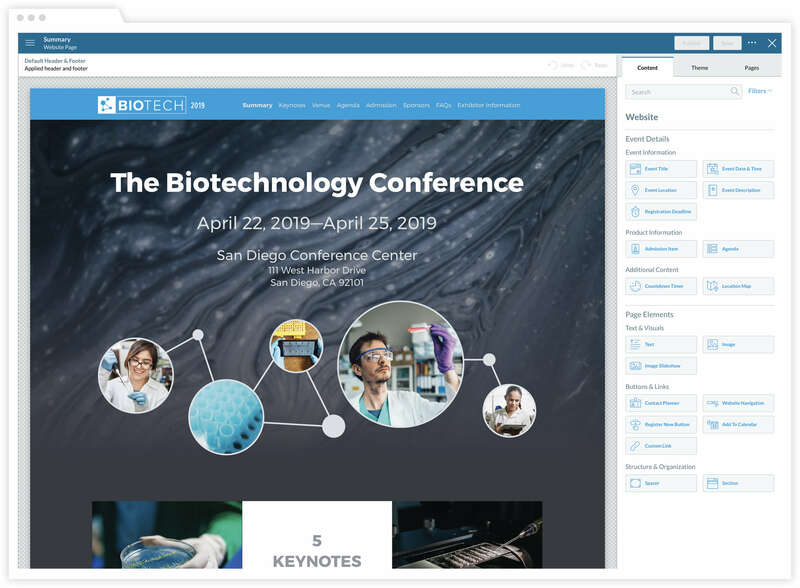 Project Flex is a complete redesign of the key piece of Cvent's platform—building event websites and registration processes for attendees. It includes both an improved user experience as well as infrastructure updates to provide a better registration experience for events. When can I get access? Project Flex is available now through an Early Adopter Program (EAP). Functionality will be deliv- ered through a series of releases with the General Availability (GA) release scheduled for Q3 of this year. At that point Flex will become the automatic option you get when you create a new event from scratch, but you will still be able to copy legacy Standard Registration events and templates through 2019. Talk to your account representative about the right time for you to join the EAP. Will I have to have to pay for Flex? No. Flex will be free for all clients. After the GA release, Flex will begin to replace the ‘Standard Registration’ event type in Cvent and we will slowly begin phasing out the legacy events. This ap- plies to both Professional and Enterprise Cvent event license types. What features will change or be enhanced as part of the Project? The project will be primarily focused on the Website & Registration areas of the application. While there will be some impact to other areas, the majority of features, like Sessions or Invitee Manage- ment, will not be impacted. Some of the key upgrades include entirely responsive sites, completely customizable registration workflows, and global design themes. Can I copy/convert my existing events or templates into Flex? Flex is built on an upgraded framework and new stylesheets, meaning existing events builds and/or templates from legacy standard event types that customers wish to copy will need to be rebuilt. However, this is an opportunity to improve those builds and can be accomplished in a fraction of the time they took to create originally. Cvent will also supply resources to help you do this. You won’t be alone in the process. What will happen to the current Standard Registration event type? Is it going away? Sometime after Flex is generally available we will shift all newly created events (from scratch) to be Flex Events. Sometime after that, we will sunset the ability to copy events and templates from the legacy event type with the goal being to retire them by the end of 2019. We will provide communi- cations far in advance of the specific dates as well as resources to help with this process. At this point, there are no urgent actions you need to take, but if you’re interested I would recom- mend you talk to your account representative. If it’s the right time for your account to join the EAP, you can begin to use Flex to practice with the site designer or even build and launch events if the current functionality supports what your event needs. If I create a Flex event, but a feature I need isn’t available yet, will I have to recreate the event after it is released? No, all features will be backwards compatible. Whenever new functionality is released, you’ll be able to simply go into the Flex event you’ve already created and turn on the feature to begin using it. This looks a lot like Express, is it going to replace it? The Express event types will remain and will continue to support streamlined workflows. Longer term they will get upgraded with the UX/UI advancements made during the process of building Flex. Will anything happen to my reporting? No, your event reporting will not be a ected by Project Flex. Flex events will be treated just like any other event, so you won’t need to make any changes to your Cross-Event reports. Will there be any changes to the email designer? Yes. As part of the project we will be updating the email designer to use the framework of the new Site Designer and optimizing it for email platforms. Any email created in the new designer will be au- tomatically responsive and can take advantage of the shared headers and global design themes. Can I still access the HTML or CSS directly within a Flex event? We’ve worked very hard to make sure that the current restrictions that drive a user to access the CSS today are covered by the site designer out-of-the-box, so in most cases this will no longer be necessary. For those clients who have advanced resources, we will o er some form of access to these advanced design elements longer term, but we are still working through the design and timing of this piece. You can contact your account representative if you have additional questions.